Announcing the California Naturalist Program Sierra Bioregional Rendezvous on October 28, 2018! Registration is open! Submit a lightning talk! 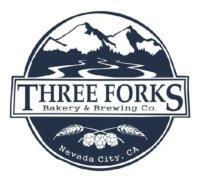 We'll meet at the Miners Foundry Cultural Center in Nevada City. 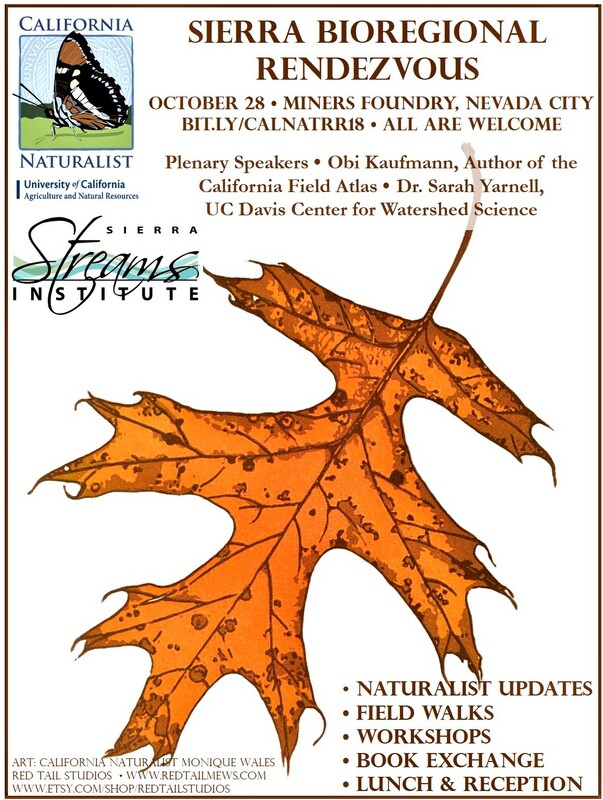 We are excited to work with our partners at Sierra Streams Institute to offer a one day gathering for California Naturalists and interested friends. All are welcome. Naturalist updates, field walks with experts, plenary speakers, lunch, and a final gathering, book exchange and reception will all be included in this fun, packed day. We'll rendezvous in the Sierra foothills to feed our curiosity, inspire each other, and build community! Obi Kaufmann is author of the award winning California Field Atlas, a lavishly illustrated, 550-page book that takes readers off the beaten path and outside normal conceptions of California, revealing its myriad ecologies, topographies, and histories with hundreds of exquisite hand-painted maps and trail paintings. For poet, painter and naturalist Obi Kaufmann, California is a magic network of living systems that connect in a grand, quilted array of ecology and beauty. Dr. Sarah Yarnell from the UC Davis Center for Watershed Sciences will speak about her work on Foothill yellow-legged frog (Rana boylii) ecology and conservation and Sierra meadow restoration. Dr. Yarnell is a recognized expert on the Foothill yellow-legged frog, a California species of special concern. Her most recent work includes evaluation and restoration of headwater systems, particularly montane meadows in the Sierra Nevada and Cascade ranges. Download Dr. Yarnell's presentation here (PDF). For this dispersed community of California Naturalists to grow and thrive, we need to actively share and learn from each other! It is important to discuss what we're doing and what we're passionate about with others. The lightning talks give a low pressure, quick-and-clean review of important highlights of your naturalist experience. They provide a fun and lively forum for attendees to share and inspire with information about their California Naturalist programs and volunteer efforts. Field Station 2012 I am a Certified California Naturalist. Now what do I do? 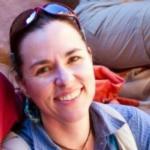 This lightning talk focuses on various ways to apply the skills learned in the Cal Nat course. I will include various real-life scenarios that have occurred to me to demonstrate that just like a professional job you must discover what is out there and demonstrate your interest. You can follow your bliss and provide meaningful assistance to organizations and projects. View Presentation. 2 Bill Finch Sierra Foothill Conservancy 2015 Ecology and Distribution of a Disjunct Population of Lewisia leeana, (Montiaceae), Eastern Fresno County The purpose of this study is to determine the ecology and map the distribution of the disjunctive population of Lewisia leeana in eastern Fresno County. Mapping was carried out during 89 hiking days in 2013-2018 which included photographing, establishing location with GPS, and posting to iNaturalist. The ongoing baseline study focuses on expanding the five areas where 15 observations of L. leeana were made from 1900 through 2006. A total 565 observations of L. leeana have been posted to iNaturalist. L. leeana is almost always found in soil of granitic origin on north facing slopes at elevations greater than 2600m, and it shows no consistent associations with any other organisms. Continued study of the distribution of L. leeana may help monitor effects of climate change. View Presentation. 3 Steve Roddy Sierra Streams Institute 2017 Interpretation Using Skulls I have used skulls hundreds of times on educational hikes. 3 typical for our area. A deer (herbivore), a raccoon (omnivore), and a coyote (carnivore). Three simple clues can help you have a better understanding of mammals! View Presentation. 4 Monique Kolster UC Merced Vernal Pools and Grassland Reserve 2016 California Environmental DNA (CALeDNA) Community Science BioBlitz Events at UC Merced Vernal Pools and Grassland Reserve California Environmental DNA (CALeDNA) is a program developed by the UC Conservation Genomics Consortium to assess and monitor the biodiversity of different habitats throughout California. UC researchers along with volunteer community scientists collect soil samples from throughout the state and then send them to UCLA to be processed for environmental DNA (eDNA), or DNA that is released from an organism into the environment. Environmental DNA sequences can then be analyzed for identification of microbes, plants, and animals to establish a baseline of the region’s biodiversity. Soil samples also are frozen at a state-of-the-art environmental DNA museum allowing future researchers to analyze change in biodiversity over time in relation to changing environmental conditions. For the last two years, I have coordinated CALeDNA Community Science BioBlitz events at the Merced Vernal Pools Grassland Reserve (MVPGR). Working alongside UC Merced faculty and the Director of the UC Conservation Genomics Consortium, California Naturalist students and graduates learn about the unique ecology of vernal pool ecosystems as they collect soil samples from this threatened habitat. View Presentation. For eight years – before, during and after the state’s recent, five-year drought – I have worked with the American River Parkway Foundation to control non-native plant species on the Parkway. With no background in biology but with a love of the outdoors, I have focused primarily on Red Sesbania, Sesbania punicea. During the drought, when we had this fast-growing invasive fairly under control, I branched out to pulling Spanish Broom, Spartium junceum, and Stinkwort, Dittrichia graveolens. Becoming a California Naturalist in 2017 led me to take stock of my volunteer work. I began to document my observations and experiences and to tell others about it, and even recruited some of them to help. After the wet Winter of 2017 and the high river flows that flooded much of the Parkway, Sesbania seemed to have sprouted everywhere. View Presentation. Who Needs Scientific Names? We All Do! Using scientific names in your programs doesn’t need to make you look like a smarty pants; they are actually a vital tool and a window into learning more about organisms in the natural world. Scientific names are usually assigned based on observed characteristics and/or evolutionary relationships. Often, “common names” can be misleading - like “Blue-eyed Grass” - which is neither blue-eyed nor a grass - but its scientific name, Sisyrinchium bellum, means a beautiful plant related to irises. We’ll also look at what goes into designating a “scientific name” and who are the “they” that keep changing scientific names and why. 7 Luke Bailey West Valley College 2015 Interpreting Wildfire and Climate Change with Santa Clara County Parks In an effort to meaningfully address 21st-century environmental issues in California, Santa Clara County Parks offers a handful of new interpretive programs addressing climate change and wildfire. Park interpreter Luke Bailey will give an overview of these programs, and provide resources to anyone who hopes to attend in the future. Download Luke's The Impact of Fire flyer and Alviso GP & SP flyer. 8 Rick Wachs Sierra Streams Institute 2016 Postcard from a Naturalist I will report on the path I've traveled since taking the Cal Nat course, observing and photographing what I see. I'll tell how my experience monitoring amphibians led to my interest in insects and spiders. I'll comment on the value of the experience as well as the value of my observations and photos to citizen science. View Presentation. 9 Nelson Balcar Pacific Grove Natural History Museum A Hoary Bat Story at Point Lobos SNR The capture and tag evolution of a female hoary bat with extraordinary overwintering site fidelity in Point Lobos SNR. 10 Lynn Hori Grassroots Ecology Naturalist Songs Begin or conclude your California Naturalist course with some original music I will perform as a kickoff to the 2018 Regional Rendezvous! Download the Naturalist Songbook. Ever found yourself admiring a moss covered rock and wishing you knew more? Are you interested in cultural history and Traditional Ecological Knowledge? Water quality monitoring & citizen science? Want to freshen up your environmental education toolkit or collaborate at the intersection of art and science? We have something for everyone at the rendezvous! 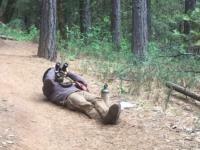 Each attendee may choose from one of five field excursions/workshops. Read about all your options here! Registration is full! Be sure to check out your field excursion and workshop choices (link above) first! The California Naturalist program is committed to building an inclusive community. We are trying something new called equity pricing that we hope will serve the community better and allow us to recover the costs of holding this event. Be sure to register ASAP for early bird pricing and if you are low income or have extenuating circumstances- We have a limited number of subsidized tickets available. Early bird pricing expires October 12. After October 12 registration prices go up by $15. If you'd like to participate in a free information exchange, please bring something fun with you to share (an old field guide or two, natural history fiction or non-fiction book, a great map, brochure to a neat place you visited, a magazine or article, poem, a nature-inspired recipe or craft, flier for an upcoming event or organization you work with etc) and plan to take something fun home in return! We'll collect your item(s) at registration and lay them out for you to peruse during the final reception. Leftover items will be donated to a public library. 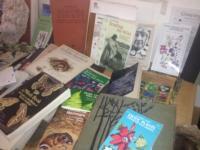 In addition, Obi Kaufmann and UC ANR publishing will have books for sale at the event. Find/Share either a ride or a rustic cabin (details on cabins below) or both on this Google spreadsheet. There are two tabs, one for a ride, one for the cabin. Located in the county seat, Nevada City is approximately 60 miles from NE Sacramento and within a 90 minute drive of eight California Naturalist course partners. Want to carpool? Find or offer a ride here. 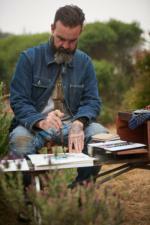 The Miners Foundry Cultural Center is located at 325 Spring Street Nevada City, CA 95959. There is a large parking lot in the back of the building and parking on the street if that lot fills. We have not booked a hotel block for the rendezvous, but we can recommend the Outside Inn, right in downtown Nevada City. Here's the Chamber of Commerce lodging site. For a more rustic experience, we recommend Woolman at Sierra Friends Center. They rent twelve A-frame 2-person cabins for $55, eight 6-person cabins for $85 and offer camping for $25 per car, all with bathhouse access. Want to share a cabin? Find cabin mates here. Located off a dirt road about 15 minutes from the Miners Foundry. Sierra Streams Institute (SSI) and California Naturalist have been collaborating to offer a Nevada city and surrounds California Naturalist certification course since 2014. SSI is a watershed monitoring, research, and restoration group based in Nevada City, California, in the Sierra Nevada foothills. Founded in 1995 as Friends of Deer Creek, SSI has grown to become an important voice in the regional scientific community—but they are still proud to call Deer Creek their home watershed. 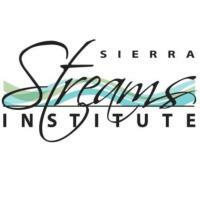 Sierra Streams Institute believes in putting the best practices of science to work on behalf of environmental and human health. They work directly with citizen scientists to collect water quality, benthic macroinvertebrate, algae, wildlife and physical habitat data. There are numerous benefits of working with citizen scientists including providing experiential learning to a diverse audience, fostering community members to be advocates for their own watershed, identifying streams in need of restoration, contributing baseline information to state and local agencies, and compiling longitudinal datasets necessary for establishing long-term trends for streams and for studying the effects of climate change. California Naturalists Monique Wales (Sierra Immersion) shared her beautiful art for the flier, "Southern Red Oak" 9” x 6” Multi-color Linocut Relief, 2018. While not strictly "our" species, it says autumn! Find more of Monique's work at her Red Tail Studios website and Etsy store. Regional Rendezvous Questions? Please call or e-mail Brook Gamble (707) 744-1424 x108.